It happens so that for the second time in turn considerable attention is devoted to the works of Ukrainian chess players in the review of monthly achievements. Masterpieces produced by Russians during the national Higher League in Kazan, have already got enough consideration on the pages of e3e5 (Sergey Klimov's analyses) and ChessPro (yours faithfully). The encounters Ivanov-Volkov and Anand-Adams were not disregarded. They got the first and the second places respectively in the voting. I hurry to calm the disappointed spectators that were going to leave the hall and go return the tickets, having suspected I am going to give them second class goods. You will still see three games of the golden September seven. I hope two other games will not make you be bored. Let us begin with the game that brought the second place in our contest (and the first place in the tournament organized by other people) to an outstanding representative of the new wave – Andrei Volokitin. In the final of the traditional Young Masters tournament in Lausanne the Olympiad champion 2004 encountered the hope of the overseas chess. 1.e4 e6 2.d4 d5 3.¤c3 dxe4 4.¤xe4 Ґd7 5.¤f3 Ґc6 6.Ґd3 ¤d7 7.0-0 ¤gf6 8.¤g3 Ґe7 9.¦e1 Ґxf3. Principally different way is also possible – 9...0-0 followed by b7-b6 and Ґb7, not rushing to part with the bishop. 10.Јxf3 c6 11.c3 0-0 12.Ґf4 ¦e8 13.¦ad1 Јb6. Seirawan preferred the play on the baseline against Leko in the Olympiad-2000 in the city of contrasts – 13...¤f8 14.a3 ¤g6 15.Ґc1 Јc7 16.¤e4 ¤xe4 17.Ґxe4 ¦ad8 18.g3 ¦d7 19.h4 ¤f8 20.Ґf4 Јd8 21.b4 Ґd6 22.Ґe3 a6 23.c4. White got the initiative on all the fronts and won with confidence. 14.Ґc1. The recent Bromberger-Vaganian encounter (San Vincent 2005) ended in a draw after 14.¦e2 ¦ad8 15.¤f1 ¤f8 16.a3 ¤d5 17.Ґg3 ¤g6 18.h4 ¤xh4 19.Ґxh7+ ўxh7 20.Ґxh4 ўg8 21.Ґxe7 ¤xe7 22.¤e3 ¤g6 23.¦de1. 14...c5. Black pieces gain more space, but White's bishops also get some prospects. 15.dxc5 ¤xc5 16.Ґc2 ¦ad8 (as an alternative move one can suggest 16...a5, although it is difficult to suggest a good plan afterwards) 17.¦xd8 Ґxd8 (18.¤f5 is strong after 17...¦xd8) 18.¤h5! It is the beginning of the brightest part of the game. Cavalry raid not just increases the amount of White's army in the area of opponents' living, but also creates the threat of 19.¤xf6+ Ґxf6 20.Јf5! 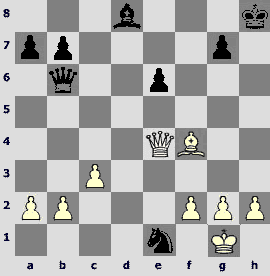 – the queen penetrates on h7, and Black has nothing good to wait for. One had to defend by 18...¤cd7 19.¦d1 ¤e5 or 19.Ґa4 ¦f8. 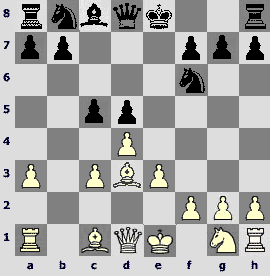 Nakamura supposed that swapping two knights will not disturb the parity of attacking and defending forces, but Volokitin had his own opinion about relative value of pieces. 19.Ґxh7+!! ўxh7 20.Јxf7! Perfect! Instead of making an exchange of pieces of the same value, White gives away two minor war units for two even less significant ones. I do not know when Nakamura realized that opponent's idea is not 20.Јxh5+ ўg8 21.Ґe3 Јxb2 (21...Ґe7 22.b4 is worse) 22.Јxc5 with equality, but in any case he had to feel strong disappointment. 20...¦f8! In case of 20...¦e7 White would have paid attention to the possibility of pinning the c5-knight – 21.Јxh5+ ўg8 22.Ґe3, winning material. 20...¤f6 21.¦e3 leads to immediate mate. An absolutely magic variation arises after 20...Јc6. By 21.¦e5! ¤f6 22.¦e3 White wins the utmost important tempo and after the forced 22...ўh8 23.¦h3+ ¤h7 24.Јg6 ўg8 25.¦xh7 Ґf6 (25...Јd7 26.Јh5 – white queen both protects the d1-square and creates decisive mating threat!) 26.Јh5 ўf8 27.¦h8+ ўe7 28.¦xe8+ Јxe8 29.Јxc5+ wins back both sacrificed pieces, and gets two extra pawns. Nakamura chooses the most witty and stubborn defense. 21.Јxf8 (21.Јxh5+ ўg8 22.Ґe3 ¦f5 23.Јe8+ ¦f8 does not promise more than equality) 21...¤d3. 22.Јf3! And white queen again attacks black pieces, without taking current material balance or safety of his fellows into account and being sure that no one can stand against its mobility. Both 22.¦d1 ¤xc1 23.¦xd8 and 22.Ґe3 Јxb2 (or 22...Јb5 23.¦f1 Ґf6) 23.¦d1 Ґf6 24.Јd6 ¤hf4! 25.¦xd3 ¤xd3 26.Јxd3+ ўg8 are obviously weaker. 22...¤hf4. In case of 22...¤xe1 23.Јxh5+ ўg8 24.Јe2 ¤xg2 25.ўxg2 Black would have had to play the ending without a pawn and with queens and bishops, like it happened in the game. 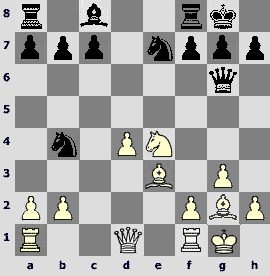 An attempt to protect both knights by 22...Јb5 also led to White's advantage – 23.¦xe6 ¤f6 (23...¤xc1?? 24.Јe4+) 24.Ґg5 ¤xb2 (24...Јxg5 25.Јxd3+) 25.h4. 25.b3! Last finesse. White preserves the integrity of his pawn structure. 25...Јa6 26.Јxe1 Јxa2. In the endgame Volokitin has to put his pieces in the passive positions temporarily. Thanks to deficient protection of Black's king, the life becomes better eventually, but Nakamura could have possibly made the realization of the advantage more difficult for the opponent. 27.Јd1 Ґb6 28.Ґg3 Јb2 29.c4 Јc3 30.ўh1. Of course, not 30.h3?? Јxg3. 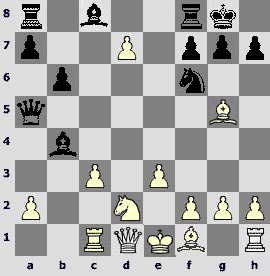 It is typical that even after blundering a piece White has a draw – 31.Јh5+. 30...e5 31.h3 Ґd4 32.ўh2 ўg8 33.Јb1 a6 34.Ґh4 Јd2. One could have continued picking on the b3-pawn – 34...b6 35.Јg6 ўh8 36.Јg3 Јc2. 35.Јg6 Јf4+ 36.Ґg3 Јf7 37.Јg5. It is too early to exchange queens. It is not easy for White to unravel the tangle on the kingside, and Black gets counterchances thanks to the king's activity, especially after playing b7-b5. 41.f4 (White wins a second pawn) 41...bxc4 42.fxe5 Ґc5 43.bxc4 a5 44.Јa8+ ўh7 45.Јxa5 Јxc4 46.e6 ўg6 47.Јc7 Јd4 48.h4 Јg1+ 49.ўh3 Јh1+ 50.Ґh2 Јc1 51.Јe5 Јa3+ (51...Јe3+ 52.Јxe3 Ґxe3 53.Ґe5 is hopeless) 52.Ґg3 ўh7 53.h5 Ґe7 54.Јf5+ ўh8 55.Јg6 Ґf8 56.ўh2 Јc5 57.h6 gxh6 58.Ґh4 Јd6+ 59.ўh3 (59.g3 Ґg7 60.Ґf6 was an easier way to the goal) 59...Ґg7 (now in case of Ґf6 the e6-pawn is captured with check) 60.Јe4 ўg8 61.Јf5 (61.e7 Јd7+ 62.g4 ўf7 63.Јc4+! ўg6 64.Јf4! would force immediate capitulation) 61...Јa3+ 62.Ґg3 Јe7 63.Ґh4 Јa3+ 64.Јf3 Јc1. In the bishop ending after 64...Ґb2 65.Јxa3 Ґxa3 66.Ґf6 White moves the king on g6 and wins easily. 65.e7 Јc8+ 66.ўh2. On 66.g4 Black would have replied 66...Јe6 (and if 67.Ґf6, then 67...h5!). He still could have led the game to this position by 66...Јc7+ 67.g3 Јc2+ 68.ўh3 Јc8+ 69.g4 Јe6, and White probably would have continued 70.ўg2 (defending against h6-h5) 70...Јa2+ 71.Ґf2 Јe6 72.Ґc5.The text-move allows mathematically accurate solution, and not the only one. 67.Јh5!? Big material advantage was provided by 67.Ґf6!, for example, 67...ўf7 68.Јh5+ or 67...Ґxf6 68.Јa8+ ўf7 69.Јf8+. But Andrei is content with one extra pawn in the pawn ending. In such an important game Hikaru decided it was necessary to check the opponent till the end. 67...Јe5+ 68.Јxe5 Ґxe5+ 69.Ґg3! Ґxg3+ 70.ўxg3 ўf7 71.ўg4 ўxe7 72.ўh5 ўf6 73.ўxh6 ўf5 74.ўh5 ўf6 75.g4 ўg7 76.ўg5 ўh7 77.ўf6 ўh6 78.g5+ ўh7 79.ўf7 ўh8 80.ўg6. Black resigned. After Volokitin has won in this epic battle, the return game turned out to be a farce. Nakamura tried to refute the Sicilian defense with the help of 2.Јh5 (someone should present him with Alexei Bezgodov's book about 2.а3, there will be more use) and was swept off the board in about 20 moves. Now let us look at the game where an Olympiad champion is defeated. 1.d4 ¤f6 2.c4 e6 3.¤c3 Ґb4 4.¤f3 d5 5.cxd5 exd5 6.Ґg5 0-0 7.e3 c5. Pet scheme of Georgian chess players. Jobava has already played like that against Moiseenko in the European team championship in Göteborg. Alexander chose 8.Ґd3 c4 9.Ґb1. After 9...Ґxc3+ 10.bxc3 ¤bd7 11.Јc2 Јa5 12.¤d2 ¤e4 13.¤xe4 dxe4 14.Ґh4 ¤b6 15.0-0 ¦e8 16.Ґg3?! ¤d5 17.¦c1 Јa3! 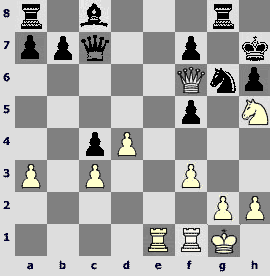 White's queenside was sealed up, and he did not manage to overcome these difficulties. Now Moiseenko chooses the variation that was played in Li Wenliang-Kacheishvili, China 2005 that entered our April review. 8.dxc5 ¤bd7 9.¦c1 Јa5 10.¤d2 b6! 11.c6 (the Chinese played 11.a3) 11...d4! 12.cxd7 dxc3 13.bxc3. 13...Ґxc3! The point! I had not come to this idea in my annotations, supposing that Black is going to get the compensation by 13...¤xd7 14.cxb4 Јxg5 15.Јf3 ¦b8 16.Јg3 Јe7. I do not know whether Moiseenko was prepared for this sacrifice. Fritz is very negative about it. 14.Ґxf6. 14.dxc8Ј ¦axc8 15.¦xc3 (15.Ґxf6? Ґxd2+ 16.Јxd2 ¦xc1+) 15...Јxc3 16.Ґxf6 gxf6 leads to the position in the game, but here Black can think about 16...Јxf6. 14...gxf6 15.¦xc3. After 15.dxc8Ј ¦axc8 16.¦c2 ¦fd8 White lags in development. In case of 17.Ґe2 ¦xd2 18.¦xd2 ¦d8 a piece is won back without fanfare. White can play more cunningly, speculating on a check from g4, but both 17.f4 ¦c5 18.ўe2!? (18.e4?! f5! ; 18.ўf2 Ґxd2) 18...¦cd5 19.¤b3 ¦xd1 (19...Јb5+? 20.ўf2 ¦xd1 21.Ґxb5 ¦xh1 22.¦xc3) 20.¤xa5 Ґxa5 and 17.Ґd3!? ўf8 18.Јe2 Јd5 lines provide him with nothing more than equality. The bishop entered the play with tempo, but its position will give Black the possibility to win the tempo back. White was not predestined to free himself from various pins in this entire game. 18...¦d6 19.Јc1 Јa5 20.Ґc4. 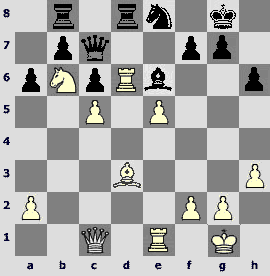 20.Ґd3 loses the piece because of 20...¦fd8. On 20.Ґb7 the subsequent variation is possible: 20...Јb5+ 21.¤c4 (21.ўe1 ¦fd8 22.¤b3 ¦d1+ 23.Јxd1 ¦xd1+ 24.ўxd1 Јd7+, and Black wins) 21...¦d7 22.Ґe4 ¦c8 23.Ґd3 ¦xd3! 24.ўxd3 Јd5+ 25.ўe2 ¦xc4 26.Јb1 (in case of 26.Јd1 Јb5! 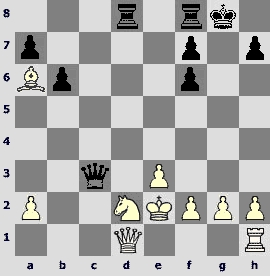 White's king dies in the fire of attack) 26...¦a4. 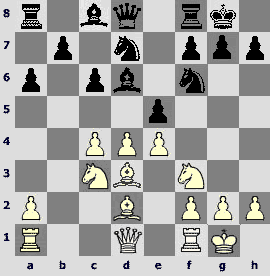 White loses a pawn, his king is still unsafe, and the opponent gets connected passed pawns on the queenside. 20...¦c8!? allows the exchange operation that most likely leads to the equality. 21.¦d1. White prefers to save the capture on f7 as a threat. After 21.Ґxf7+ ўxf7 22.Јxc8 Јxd2+ (22...¦xd2+ 23.ўf3 Јd5+ 24.ўg3 creates less problems) 23.ўf3 Јd5+ 24.e4 (weaker is 24.ўg3?! f5 with idea ¦g6, and 24.ўe2? loses because of 24...¦c6! 25.Јb7+ ўg6 with subsequent ¦c2+) 24...Јd3+ 25.ўf4 Јe2 26.Јc7+ ўe6 (or 26...ўg6 27.Јxd6 Јxf2+ 28.ўg4 Јxg2+ 29.Јg3 Јxh1 30.ўh3+ with equal queen ending) 27.Јc8+ ўe7 28.ўg3 ¦d3+ 29.f3 ¦d2 30.Јh3 a draw seems to be the most likely result. 21...ўg7. 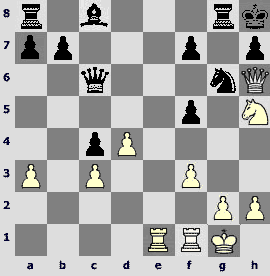 21...¦cd8 22.Ґb3 is worse, and White's minor pieces begin to move. 22.Јb1. 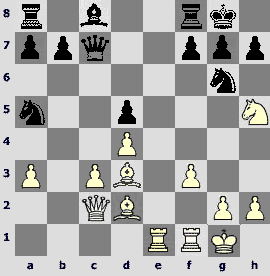 Queen retreats in the way that rook remains protected (in case of 22.Јb2 Јh5+ White could not have replied 23.ўe1? ¦xc4). Computer shows that at the current moment there is nothing to be afraid of. After 22.h3!? Black cannot use the bishop pin, because 22...b5 is countered by 23.Јb2 bxc4? 24.¤xc4. 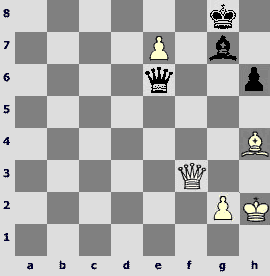 23...¦xd2+ 24.Јxd2 Јxd2+ 25.¦xd2 ¦xc4 leads to equal rook ending. 22...¦cd8!? Giorgadze refuses to restore material equality and pins opponent's pieces anew. 23.Јc2 Јh5+ 24.ўe1 Јxh2 25.Ґf1 Јh5. Now it is seen that White's situation is rather unpleasant. He is no worse objectively, but lacks constructive ideas, while Black can move the queenside pawns closer to the promotion squares and see what can be done further. 26.Јc3 b5 27.Јb4 a6 28.f3?! In such positions mistakes are as natural as infant's smile at the sight of successful combination. 28...Јe5 29.ўf2. 29.Јb3 loses immediately to b4! followed by Јc3! After 29.Јf4 Black could take a second pawn – 29...Јb2 30.e4 Јxa2. 29...a5! 30.Јxa5 (and after 30.Јg4+ ўh8 the knight cannot be rescued) 30...Јb2 31.ўg1 (31.ўe1 b4-+) 31...¦xd2 32.Јxd8! ¦xd8 33.¦xd8 b4!? (33...Јxa2 34.Ґxb5 Јa5 35.¦d5 Јe1+ 36.ўh2 Јxe3 37.Ґd7). 34.¦a8? There are no doubts that Moiseenko was in a time trouble. He found an interesting queen sacrifice, but failed to utilize it in the most precise way. 34.¦d4! would be much stronger. For example, after 34...f5? 35.Ґc4 there is a fortress on the board. In case of 34...Јa3 35.ўh2! f5 (35...Јxe3 36.¦xb4 Јe1? 37.¦g4+) 36.Ґd3 Јxa2 37.¦xb4 Јd2 38.¦d4 Јxe3 39.¦d5 White hangs on the thread, but there is no forced loss seen. If he manages to consolidate, then it would be hard for Black to convert the advantage with such a pawn structure. And now poor coordination of White's pieces inevitably leads to further losses. 34...f5! 35.¦a6 (35.¦a4 Јd2 36.ўh2 Јxe3 37.¦xb4 Јe1) 35...Јd2 36.g3 Јxe3+ 37.ўg2 h5 38.f4 h4 39.gxh4 Јxf4 40.h5 Јg4+ 41.ўf2 Јxh5 42.¦c6 Јh4+ 43.ўg1 Јd4+ 44.ўh1 Јf2 45.Ґg2 f4 46.¦c4 f3 47.Ґh3 Јe1+ 48.ўh2 Јe2+. White resigned. The Georgian grandmaster played all the game very strongly and consistently. Then we have two more encounters, played on the Isle of Man. And everything is fair again – one Ukrainian wins, another is defeated. Like in Volokitin-Nakamura case, this game was of great sporting importance. Having won it, Areshchenko opened himself the way to sharing the first place with Shabalov (and the Ukrainian champion had a better tie-break). 1.e4 e5 2.¤f3 ¤c6 3.d4 exd4 4.¤xd4 Ґc5 5.Ґe3 Јf6 6.c3 ¤ge7 7.g3 d5 8.Ґg2 Ґxd4. 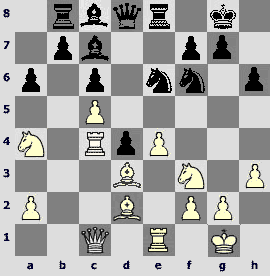 Karpov equalized by 8...¤xd4 9.cxd4 Ґb4+ 10.¤c3 Ґxc3+ 11.bxc3 dxe4 12.Ґxe4 c6 against Salov (Reggio-Emilia 1992). 8...dxe4 is possible, but it gives White the choice between going to the position in the game by 9.¤d2 Ґxd4 10.cxd4 0-0 11.¤xe4 Јg6 and a sharper 9.¤b5. 9.cxd4 dxe4 10.¤c3 0-0. Romanishin successfully applied 10...Ґf5 11.¤xe4 Ґxe4 12.Ґxe4 Јe6 13.Ґg2 Јc4 in the old game with Gheorghiu (Leningrad 1977). 11.¤xe4 Јg6 12.0-0 ¤b4. After the natural 12...Ґe6 Black should not be afraid of 13.¤c5 Ґd5 14.¤xb7 ¦ab8. The text move was also tested in practice. 13.¤c5. A new plan. Previously White tended to choose 13.¤c3 c6. 13...¤bd5 14.¦e1 c6. Here and further proud black king does not want to be exchanged into the opponent's dark squared bishop locked by his own pawns. 15.¦c1 ¦b8. It seems that Mikhail wanted to solve the problem of development without moving the queenside pawns. Both 15...b6 16.¤d3 Ґb7 17.¤e5 Јd6 and 15...a5 were possible. 16.Јd2 Јd6. The only black bishop entered the game – 16...Ґf5, and it caused two white bishops leaving the board – 17.Ґf4! ¤xf4 18.Јxf4 ¤d5 (18...¦fe8?? 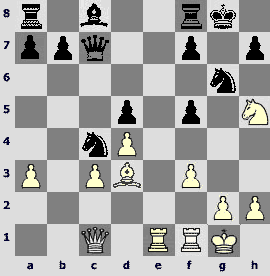 19.¦xe7) 19.Ґxd5 cxd5 20.¦e5 with obvious superiority of the knight over the bishop. So Black takes stronger control over the h2-b8 diagonal. This double-edged axis becomes the centre of upcoming events. 17.Ґg5 f6 18.¤e4 Јc7. 18...Јd8 could be followed by 19.Ґf4 ¤xf4 (one cannot resolve to make a move like 19...¦a8) 20.Јxf4 Ґe6 21.Јd6 Ґf7 22.Јc5 with White's initiative. 19.¤c3! Јd6. The key significance of mentioned thoroughfare is revealed in the short variation 19...¤xc3 20.Ґf4! A series of exchanges after 19...fxg5 20.¤xd5 ¤xd5 21.Ґxd5+ ўh8 22.Јxg5 Јb6 23.Ґb3 Јxd4 leads to the position, where White preserves the advantage thanks to owning central files, for example, 24.¦c2 Ґf5 25.¦d2 Јg4 (25...Јf6 26.Јxf6 ¦xf6 27.¦e7) 26.Јxg4 Ґxg4 27.¦d4. 19...Јd8 20.Ґf4 ¦a8 was more cautious. 20.¦xe7! Oh it began! Now Alexander will not calm down till the end of the game. 20...Јxe7. Other choices are much worse – 20...¤xe7? 21.Ґf4, or 20...fxg5 21.¤xd5 cxd5 22.¦cc7, or not that fatal, but still not recommended: 20...¤xc3 21.¦xg7+! ўxg7 22.Ґh6+ ўg8 23.Ґxf8 Јxf8 24.bxc3. 21.¤xd5 cxd5 22.Ґxd5+ ўh8 (of course, 22...Ґe6 23.¦e1 fxg5 24.¦xe6 is bad) 23.Ґf4 ¦a8 24.¦c7 Јd8 25.Ґg2 (on 25.Ґb3 White could not have liked 25...Ґh3) 25...¦e8 (preparing g7-g5, that did not work earlier because of 26.Јc2) 26.d5 g5. In case of 26...¦e7 White should not exchange queens: in case of 27.d6 ¦xc7 28.dxc7 Јxd2 29.Ґxd2 a5 it is not clear how to use the strength of the c7-pawn. And after 27.Јb4!? ¦xc7 28.Ґxc7 Јe8 29.d6 White's passed pawn is really dangerous. 27.Ґxg5! This beautiful sacrifice that provides White with at least a draw. 27...Јxc7 28.Ґxf6+ ўg8 29.Јg5+ ўf8 30.Јh6+ ўg8 31.Јg5+ ўf8 32.Ґc3! Inventiveness and persistence were rewarded in this case. 32...a5? Not in time. I did not find the decisive continuation after 32...Јe7 33.Јh6+ (it is easy to lose the king in the heat of the attack – 33.Ґf6?? Јe1+ 34.Ґf1 Јxf1+! 35.ўxf1 Ґh3+ 36.ўg1 ¦e1#) 33...ўg8 34.Ґe4, and only here 34...a5! (outlining ¦a6) 35.d6 (35.Ґf6 Јf7) 35...Јf7 36.Јg5+ ўf8. It seems that the perpetual can only be postponed for a few moves. 32...Јf7 33.Ґb4+ ¦e7 34.d6 ¦d7 35.Ґd5 Јg7 36.Јf4+ ўe8 is worse, and White has resources for maintaining the attack – 37.Ґc3!? Јf8 38.Јe4+ ўd8 39.Ґa5+! b6 40.Ґd2. In view of the Ґg5+ threat one rook is won back, and White does not lose the initiative. 36.Јf6! 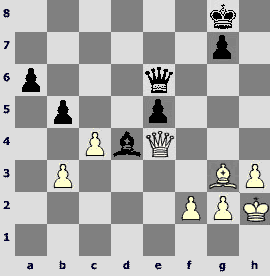 Only the rook sacrifice rescues him from being mated, and after that White has three pawns for an exchange. 36...¦e1+ 37.Ґxe1 Јg7 (37...Јc1 38.Јe7ќ) 38.Јd8+ Јf8 39.Јg5+ Јg7 40.Јd8+ Јf8 41.Јh4 Јf5 42.Ґe4 Јg4 43.Јxh7+. Black resigned because of 43...ўf8 44.Ґg6 Јd7 45.Јh8+ ўe7 46.Јe5+ ўd8 (46...ўf8 47.Јf6+ ўg8 48.Ґc3) 47.Ґd2. 1.d4 d5 2.c4 c6 3.¤f3 ¤f6 4.¤c3 e6 5.e3 a6 6.b3 Ґb4 7.Ґd2 ¤bd7 8.Ґd3 0-0 9.0-0 Ґd6 10.e4. In the only game that was lost in Kazan by the winner of the tournament both opponents thoroughly prepared the collision in the centre – 10.Јc2 ¦e8 11.¦ae1 h6 12.h3 e5 13.cxd5 cxd5 14.e4 dxe4 15.¤xe4 ¤xe4 16.¦xe4!? ¤f6 17.¦h4 exd4 18.Јc1 Ґf8 19.¦xd4 Јb6 with approximately equal position, Bareev-Kobalia. Of course, the tournament practice saw both 10...e5 11.cxd5 cxd5 12.e4 and the text-move. 12.c5. 12.d5 ¤c5 13.Ґc2 Ґg4 leads to a complicated play with mutual chances. 12...Ґc7 13.¤a4 exd4 14.h3 ¦e8. The f6-knight cannot move to е5 via g4, and with 14...¤e5 15.¤xe5 Ґxe5 16.f4 Ґc7 17.Јc2 White gets good perspectives in the center and on the kingside. 15.¦e1 h6 16.¦b1. Now I know (or, more correctly, remember) theory much worse than a few years ago, and can see some things with a fresh eye. For example, having seen this game for the first time, I thought, "He conducts it nice – sacrificed a pawn, is not going to win it back, organized the blockade in the centre, made the prophylaxis. And he played so strong further, and his rating is below 2400!" I was right prasing his subsequent play, but searching my database here resulted in finding the game Kasparov-Gelfand game, Linares 1991 (I examined it and found I had some memories about it). No wonder his play charms that much. 16...¤f8. 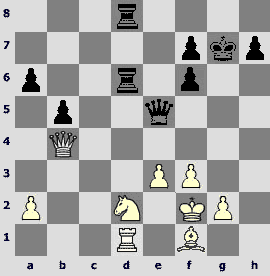 Boris played 16...¤h7, and after active maneuvering 17.Ґc4 Јf6 18.¦b3 ¤hf8 (Anand suggested 18...¤g5!? with an idea of 19.¤xg5 hxg5 20.¦f3 Ґf4 21.g3 ¤e5) 19.Ґc1! ¤g6 20.¤xd4 ¤de5 21.Ґf1 ¦d8 22.Ґb2 ¤h4 23.¦ee3! his pieces finally had to move back on the unprepared positions. 17.Јc1 ¦b8 18.¦b4. Palliser places the emphasis on the center values. 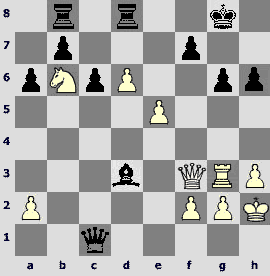 In the Najer-Kobalia blitz game (playchess.com 2004) Evgeniy went to mate – 18.¦b3 and succeeded in general. Then there was 18...¤e6 19.e5 ¤d5 20.Ґxh6!? ¤c3 (when playing the blitz, one clearly does not want to repel the attack after 20...gxh6 21.Јxh6 ¤f8 22.¦e4) 21.¤xc3 dxc3 22.Ґb1, and White preserved good chances for attack with material equality.19...¤d7 is more careful, sending the knight to defend the king. 19...Ґa5?! There was sense in holding the pawn. In case of exemplary 19...¤d7 20.e5 Јe7 21.Ґb1 ¦d8 22.Јc2 ¤df8 23.¤b6 Ґd7 there was a swampy position where Black hardly stands worse. 20.Ґxa5 Јxa5 21.¤xd4 ¤xd4. Subsequent events will show the vainness of Black's bishop. 21...¤f4! 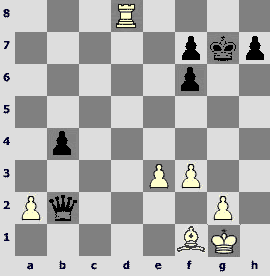 22.Ґc2 Ґe6 23.¤xe6 ¤xe6 deserved attention, without losing the knights. 22.¦xd4 Јc7. The essential care is taken. After 22...Ґe6?! 23.¤b6 with the threat of ¦a4 the queen could be rescued only by 23...¤d7 24.¤xd7 ¦bd8, and White could continue 25.¤f6+ gxf6 26.¦xd8 ¦xd8 27.¦e3, looking at the opponent's king. 23.¦d6. Natural 23.¤b6 also looked nice. One should not be afraid of black queen's centralization, in case of 23...Јe5 24.¦d6 (with an idea of f2-f4) 24...¤h5 25.Ґc4 ¤f4 26.Јe3 Јg5 27.Јg3 White stands better. 23...Ґe6. The dismissive 23...b5!? 24.¤b6 Ґe6 has its own advantages and disadvantages. In this variation 24...¦xb6? is bad because of 25.e5! 24.¤b6 ¦ed8. After 24...¤d7 25.¤xd7 Ґxd7 26.e5 White has a clear plan of attack on the kingside (Јf4-e4, f4-f5). 25.e5 ¤e8? It is a principled, but weak move. The idea to sacrifice is absolutely correct, and one had to leave the rook where it was. After 25...¤d5 Black's position is defendable. 26.Јf4! Јe7. The scheme of the upcoming attack can be observed in the line 26...Ґxa2 27.¦e3 Јe7 28.¦g3 ¤xd6 29.cxd6 Јf8 30.Јxh6 g6 31.Јh5ќ. 27.¦e3 ¤xd6 28.cxd6 Јg5 29.Јe4 g6 30.¦g3 Ґf5. If Black leaves the king to the mercy of fate by 30...Јc1+ 31.ўh2 Ґxa2 32.¦xg6+ fxg6 33.Јxg6+ ўf8 34.Јf6+ ўg8, then merciless f-pawn reads the verdict – 35.f4ќ. 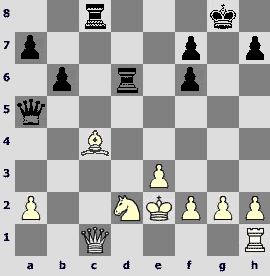 It also becomes White's decisive argument after 30...Јh5 31.Јf4 ўh7 32.Јf6 ¦g8 33.f4. In the continuation chosen by Black the e-pawn solos. 33.e6! Beautiful intermediate move destroys the constructions around black king. 33...Јc5. In case of 33...fxe6 34.Јxd3 ўh8 the queen goes up the stairs with visit – 35.Јd4+ ўh7 36.Јe4 ўh8 (36...¦g8 37.¤d7) 37.Јe5+ ўh7 38.Јxe6 g5 39.Јf7+ ўh8 40.Јf6+ ўh7 41.¦e3 with the victory. 34.Јxf7+ ўh8 35.Јf6+ ўh7 36.¦xd3 Јxb6 37.Јf7+ ўh8 38.Јxg6 Јxf2 39.Јxh6+ ўg8 40.e7 ¦d7. Having passed the control, Black made sure his position is hopeless and resigned. In conclusion I will annotate the game that was sent to the contest by the author himself and got the 7th place, which is very honorable, bearing in mind such a competition. Mikhail Prusikin added the variations to the text. Alexander Baburin added some words annotating the encounter for Chess Today. I will translate them into Russian, and maybe add something myself, and so our joint efforts will please the reader. 1.d4 d5 2.c4 e6 3.¤c3 Ґb4 4.e3 ¤f6 5.a3. Objectively this is the most principled line – White gets quite an advantageous version of the Saemisch system in the Nimzo-Indian defense. The opportunity of exchanging the c-pawn at any moment, thus getting rid of doubled pawns, is the main advantage of his position. 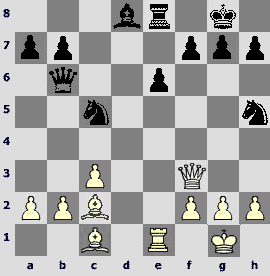 The standard plan of White consists in ¤g1-e2, f2-f3 and preparation of e3-e4. 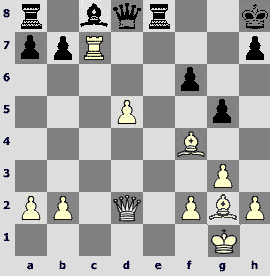 Black usually tries counteracting it by exchanging light-squared bishops (8...0-0 9.¤e2 b6). Korchnoi tries other ways of solving the problem. 8...Јa5?! 9.¤e2 (9.Ґd2 ¤e4=) 9...cxd4 10.exd4. Now White won't be able to play e3-e4, on the other hand the diagonal got opened for his dark-squared bishop, besides the maneuver 8...Ја5 was linked with loss of time. 10...0-0 11.0-0 ¤c6. In case of 11...b6? 12.Ґd2 a bad position of the black queen tells. 11...Ґg4 12.f3 Ґh5 13.¦b1 Јc7 14.Јb3 b6 15.¤f4ќ also leads to a serious advantage of White. 12.f3 ¦e8. 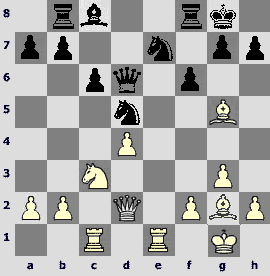 In the game Sokolov – Inkev (Stockholm 1987) there was 12...h6 13.Ґf4 with advantage to White. 13.Ґg5 ¤d7 14.Ґd2 ¤f8 15.¤f4 ¤g6. Trying to draw attention of the knight away from the d5-pawn. And he digresses with pleasure. 16.¤h5! Јc7 17.Јc2 ¦f8. The only satisfactory defense. 18.f4!± is to follow to17...Ґd7 and the pawn marches on f6. In case of 17...¤ce7 White wins by18.Ґh6! gxh6 19.Јd2 ўh8 20.Јxh6 ¦g8 21.¤f6. Too optimistic. The development should have been completed by 18...Ґd7 and after 19.Јc1 (19.f4 f5) Black has time to save his king from the punishment narrowly – 19...ўh8 20.Ґh6 gxh6 21.Јxh6 ¦g8 22.¤f6 ¦g7. However White has a strong resource 23.Ґf5!! at his disposal, keeping a dangerous attack. 19.Ґg5! !ќ Exactly! The bishop comes from a different side. To 19.Ґh6? gxh6 20.Јd2 there is 20...f5 with a won position for Black. 19...¤c4. The main threat of White works in other variations: 19...Јc6 20.Ґf6! gxf6 21.Јd2ќ, or 19...Ґd7 20.Ґf6 gxf6 21.Јd2 ўh8 22.Јh6 ¦g8 23.¦e7ќ, or 19...f6 20.Ґxf6! gxf6 21.Ґxg6 f5 (21...hxg6 22.Јxg6+ ўh8 23.Јh6+ ўg8 24.¤xf6+ќ) 22.Ґe8 f4 23.Јf2 Јd8 24.¤xf4! ¦xe8 25.Јg3+ with a mating attack. It's impossible to block the position by f7-f5 as White sweeps away the obstacles, using the g-pawn as a ram 19...f5 20.g4! h6 21.Ґxf5 Ґxf5 22.gxf5 hxg5 23.fxg6 Јd6 24.h4 gxh4 25.f4 ¤c4 26.f5 ¦ae8 27.f6ќ or 19...ўh8 20.f4 f5 21.g4ќ. 20.Ґf6!! gxf6 21.Јc1! Only equality after 21.¤xf6+ ўg7 22.¤xd5 Јc6 23.¤b4 Јc7=. 21...f5 (21...ўh8 22.Јh6 ¦g8 23.¦e8 with a quick mate). 22.Ґxc4! dxc4 23.¤f6+ ўg7 24.Јg5! Јc6. 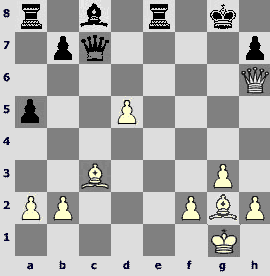 Leads to a spectacular final: 24...h6 25.¤h5+ ўh7 26.Јf6 ¦g8. 27.Јg7+!! ¦xg7 28.¤f6+ ўh8 29.¦e8+, mating in two moves. Here is another variation, which is pleasant to look at: 24...Јd8 25.¤h5+ ўh8 26.Јh6 ¦g8 27.¦e8!!ќ. We see a bit more complicated version in the game. Also does not save 24...h5 25.¤xh5+ ўh7 26.Јf6 ўh6 (26...¦g8 27.¦e8 Ґe6 28.¦xa8ќ) 27.f4 ¦g8 28.¦e8ќ. 27.¦e8!! Јxe8. Black has to part with the queen as to 27...¤f8 28.¤f6!ќ is decisive. 28.¤f6 Јe3+ 29.Јxe3 f4 30.Јe4 ¦d8 31.d5 (the rest is simple) 31...ўg7 32.Јd4 ўh6 33.g4 a5 34.h4 ¤xh4 35.ўf2 ¦a6 36.¦h1 ўg6 37.¦xh4. 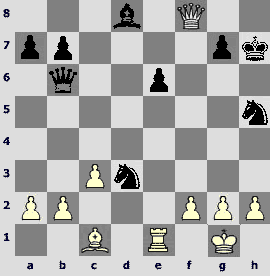 In view of 37...¦xf6 38.¦h6+ ўxh6 39.Јxf6# Black acknowledged his defeat.